As the rising sun made its way around the world, discovery and chatter about the healthcare hashtag project slowly began to emerge. It was the most comprehensive list of hashtags dedicated to the healthcare conversations taking place on Twitter. And it was a list that was both interactive and social. In the ensuing days we began to receive submissions of hashtags to add to this list from various members of the healthcare Twitter community. The first three of which were #naturalhealth, #casemanagement, and #healthlit. From the onset the Healthcare Hashtag Project has been about lowering the barrier to entry, facilitating discussion, and creating an environment in which the users are able to participate and make their voices heard. And it’s that third point that dedicates this birthday party as a celebration of what the Healthcare Twitter Community at large has contributed. A special thanks, once again, goes to those individuals whose consultation helped us to formulate our initial thoughts on how to present this project and to make it a social experience. A specific section for Tweet Chats and an accompanying interactive calendar with a Tweet Chat schedule embedded on it. The provision of hashtag transcripts, on demand, with customizable date/time ranges and more. Hashtag analytics including top ten users by mention, top ten users by number of tweets, most shared resources and more. A specific section for Healthcare Conference Hashtags to help facilitate the conversations at those events, and to better share with those who are not in attendance. 172 – Number of hashtags introduced on the first day. 292 – Number of visits to main hashtag page on the first day. 38 – Number of times that the #hcsmeu page, the most popular of the day, was visited on the first day. 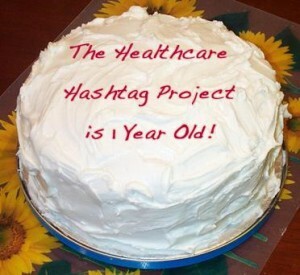 418 – Number of “regular” hashtags tracked in the Healthcare Hashtag Project as of today. 36 – Number of Tweet Chat Hashtags tracked as of today. 165 – Number of Healthcare Conference Hashtags listed as of today. 33,000+ – The average number of healthcare related tweets being added every day to our database. 14 Million+ – The number of healthcare related tweets currently in our Healthcare Hashtag database. While there’s been some considerable growth in the usefulness of this project, we realize that needs and interests are rapidly changing. Consequently, we’ll continue to search for new ways to meet the evolving expectations of healthcare’s Twitter community. And, as always, it’s our desire to keep this project social. So your thoughts and suggestions are very welcome here. Lastly, we so very much appreciate the support and all the terrific relationships that we’ve made through our work on, and use of, this project. And I think for everyone that’s the best part about it … the new connections that these hashtags help foster.